the left and right side frame covers are installed symmetrically and therefore the removal/installation procedure for one side is the same as that for the other side. 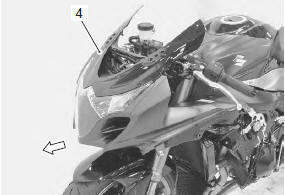 Remove the side frame cover (2). Remove the side frame covers. Remove the front seat by removing the bolts. Slide the seat hooks into the seat hook retainers on the frame and tighten the bolts. Install the side frame covers. Remove the rear seat or seat tail cover with the ignition key. 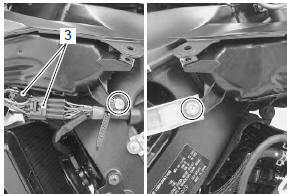 Slide the hook into the hook retainer and push down firmly until the rear seat/seat tail cover snaps into the locked position. Loosen the rear view mirror mounting nuts. Remove the windscreen (1) by removing the screws. Install the windscreen in the reverse order of removal. insert two nuts into the hole of cowling brace. Insert four nuts (top and bottom ones) into the windscreen. 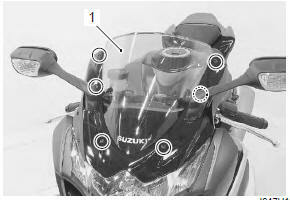 Tighten the rear view mirror mounting nuts to the specified torque. Remove the fasteners (8 pcs.). Remove the body cowling cover (1). 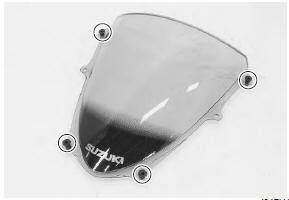 Install the body cowling cover in the reverse order of removal. Remove the fasteners and cowling bracket (1). Install side cowling in the reverse order of removal. 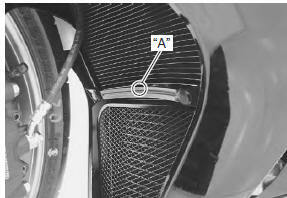 when installing the right side cowling, make sure that the fuel tank drain hose and breather hose are routed properly. 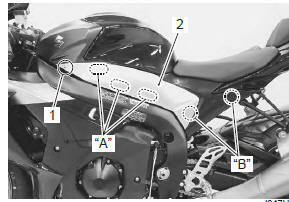 Refer to “fuel tank drain hose and breather hose routing diagram” in section 1g . When installing the bracket, set the punch mark “a” to the front and upper side. the left and right inner under cowlings are installed symmetrically and therefore the removal/installation procedure for one side is the same as that for the other side. 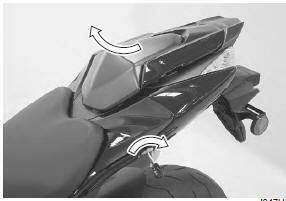 Remove the inner under cowling (1). Install the inner under cowling in the reverse order of removal. Remove the body cowling cover. Remove the left and right side cowlings. Remove the inner under cowlings. Remove the combination meter. Refer to “combination meter removal and installation” in section 9c . 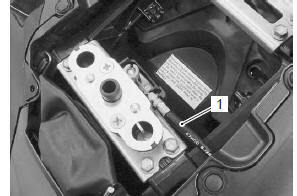 Disconnect the turn signal lead wire couplers (1). 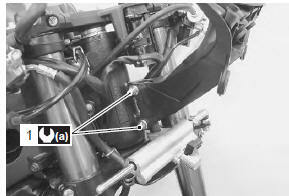 Disconnect the steering damper lead wire coupler (2). Disconnect the lead wire couplers (3). Remove the air intake pipe bolts. Remove the body cowling assembly (4) forward. Disassemble the body cowling assembly. 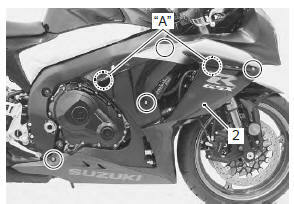 Refer to “headlight removal and installation” in section 9b . Install the body cowling in the reverse order of removal. adjust the headlight beam if necessary. 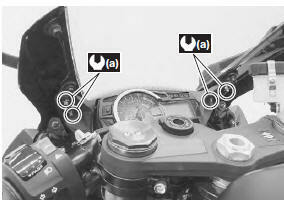 Refer to “headlight beam adjustment” in section 9b . Install the intake pipes in the reverse order of removal. 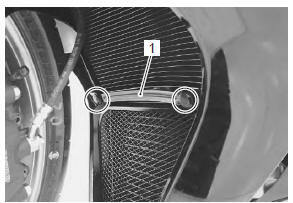 Remove the cowling brace (1). Install the cowling brace in the reverse order of removal. 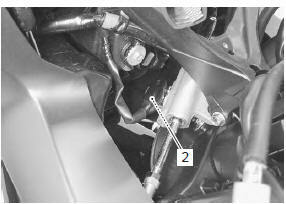 tighten the cowling brace mounting bolts (1) to the specified torque. Remove the front and rear seats. Remove the bolts and fasteners. 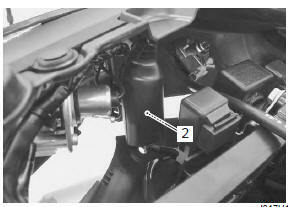 Disconnect the seat lock cable (1). 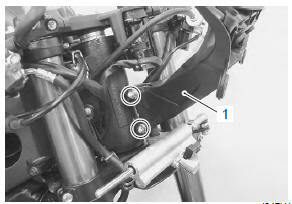 Disconnect the rear combination light coupler (2). Remove the frame cover assembly from the frame. Disassemble the frame cover assembly. 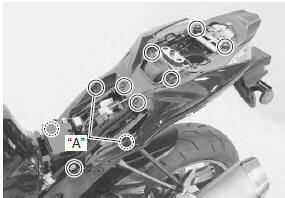 Refer to “rear combination light removal and installation” in section 9b . 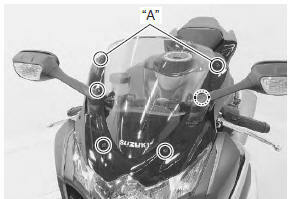 Install the frame cover assembly in the reverse order of removal. 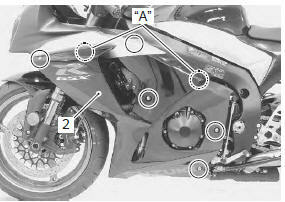 Refer to “rear fender construction” .